I grew up in Battersea, under the approach for Heathrow (although still about 10 or 12 miles away). Everything was noisy back then - Spey powered 1-11's and Trident's. 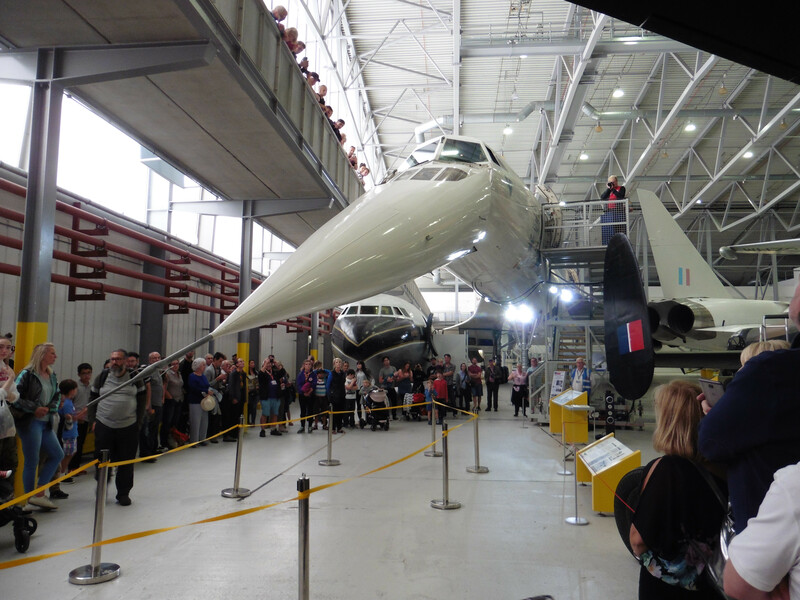 Concorde, beautiful though it was, stopped conversation inside the house twice every evening when it came over because of the noise. When it was retired I was working in an office on the river at Brentford, and the last three came past one after another. A while later (probably months) an enormous barge came past the office, and dropped anchor a bit further up the river at Syon Park. I found out when it was going to be loaded and went down to watch. I miss its beautiful shape, but I don't miss the noise. I took mini-hatler and my father to a car park to the north side of the northern Heathrow runway to stand on the car's roof to watch the very last take off. Mini would have been about 2. Stirring stuff. How do you get gigs like this? One of the last three which flew in to Heathrow. Oh well, a bit of luck with Mrs Jaded and me saying "Please say yes to the invite!" I've been hunting out my Concorde footage, hence the last flight one from above. 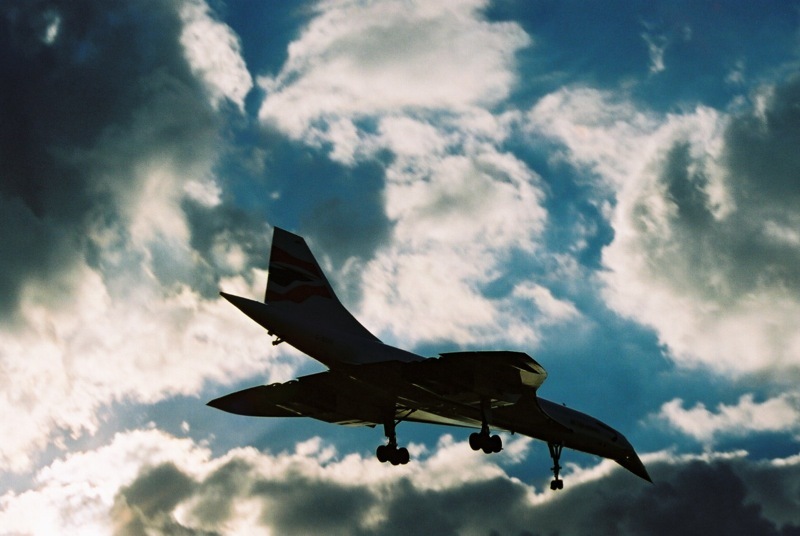 I also found a photo of when we were at Filton when Concorde took off. We'd been invited to look round the plane, but it was running late, so instead we stood on the grass as it taxied down past us, turned up the runway and disappeared in an extraordinary display of acceleration and noise. Noise that made my fundamentally deaf MiL declare "I heard that!". 'Ah, the 917, one of my favourite cars, too. Bobby Rahal told me the other day he was on the look-out for one, to add to his growing collection of classic racing cars, and I wasn't surprised. It was one of the true greats, and the first 'big' sports racing car Porsche ever built. Initially, though, it was grossly under-developed, and extraordinarily unstable. The car actually made its debut at the Nurburgring 1000kms in 1969, and Frank Gardner was one of the drivers, partnering David Piper. In its early guise, the 1969 917 is generally held to have been one of the spookiest racing cars of all time, and Gardner's account rather consolidates that view. "I got a call from the competitions manager - and the money they were offering was certainly good enough to cross a strip of water and get in the thing. I think the reason they bestowed this honour on me was that every 917 driver was in hospital at the time, recovering from various stages of disrepair..."
As you read these words, it is essential to imagine them from the mouth of Frank himself, in a laconic, downbeat, Aussie drawl. "I remember that Piper did one lap in practice, and was all for going back to England, but I pleaded with him to stay because the money was right. "This was one of the very first 917s, with an alloy chassis, which was gas-filled. There was a big gauge in the cockpit, which measured the gas pressure, and that was there to keep you informed of the chassis's condition. If it zeroed, they said, that meant that the chassis was broken, and I should drive mit care back to the pits. "Then there was the engine. You had about 300 horsepower at 5000 revs, and then between 5000 and 6000 you picked up another 300! So it was a bit of delight, really, and it was on narrow nine-inch rims all round. The computer had said that nine-inch rims would make the car very quick in a straight line, but the computer wasn't strapped in the bloody seat up in the Eifel mountains, where you tend to get the odd corner..."
Nor was that the end of it. "You sat between these pannier tanks, which bulged when they put the fuel in. It took 40-odd gallons because it was pretty hungry." It was also, even with ear plugs in place, quite extraordinarily noisy, to the point, Gardner said, of being disturbing. "It was bloody hard to think. You were horrified by all the activity, your brain numbed by the vibration, the power and the wheelspin. "In those days they were still gas-welding chassis, and this thing flexed so much that the actual position of the gearchange used to alter. You'd reach out for where the lever had been last time you used it, and it wasn't there! It had moved. "Nothing about the car was consistent, that was the thing. When it became airborne, sometimes it would sort of float through the air, and other times it would crash down. It never did the same thing twice. Just when you thought you had it worked out, it'd pull another trick. "It was simply indescribable, the motor car, and the weather did its best to help, as well. Snow and rain all the way. You were just so crossed up in the thing that you didn't know which way was straight ahead in the finish. But we got it through to the end, seventh or somewhere, and in addition to paying me money, they did try to take up a collection for an Iron Cross, which they reckoned I'd earned..."
There followed an invitation to drive the 917 at Le Mans in June, but Frank decided not to accept. "Again, the money was great, but I'd had my lesson. Rolf Stommelen went like hell with the thing, but he had the whole of the Fatherland on his back, and he had to rise to the occasion. Like I always said. I never really wanted to be the quickest bloke in motor racing - I just wanted to be the oldest. And that car was certainly going to interfere with those plans..."
Brian Redman was one of the Porsche factory drivers in that era, usually partnering Jo Siffert, and he, too, remembers the 917 with, let's say, a wry smile. "I drove one in practice at Le Mans in '69, and it was the fastest I ever went there - 238mph. But it was all over the road; on Mulsanne you were constantly having to correct the steering, and you just hoped that when you arrived at the kink you were on the left side of the road... If you weren't, you had to brake! "The spaceframe of the original 917 was pressurised, gas-filled, so that if the gauge lost more than so much pressure, you knew you had a crack. When that happened, they'd go round all the joints with a cigarette lighter!" Yup, think I read that before. Still a terrifying machine even when they got it sorted, mind you.....600+ bhp in wafer-thin fibreglass with driver's legs as crumple zone?!!! Someone's got a 917K road-registered in Monaco, using Count Rossi's car as a precedent...mad bugger. I think one flew over my gran's house for an airshow and she claimed it cracked a window. She was so angry we went to the council office. I was about two, so have little memory of this exciting event. I presume the council fixed the window. Didn't they float one down the Thames on a barge several years back or has my highly fertile imagination provided me with an image of it sailing by Isleworth while I scoffed an ice cream? (actually, it might just have been the nose). I did, on the other hand, enjoy the surreal image of the Space Shuttle in NYC as they moved it up the Hudson to the USS Intrepid Museum, viewed down the cross streets you couldn't see the barge so it actually seemed to be floating through the city – a few day's previous I got to watch another Space Shuttle doing its final laps around Washington DC astride the 747 (the combination really looks like it shouldn't fly), which was pretty awesome, though my wife trumped me by landing at Dulles at the same time as the Shuttle landed (well, the 747 and a couple of support planes). If I recall, they were sending Enterprise to NYC and replacing it with Discovery. I grew up with the Space Shuttle so I was a very happy person. It was surprising how worn Discovery looked, they'd worked it hard. Ah, I just look at the pictures. It was indeed at the little bit of Thameside between Isleworth and the entrance to Syon Park. I didn't imagine it. Or the ice cream. I have pictures of the Space Shuttle, so I know that's real. 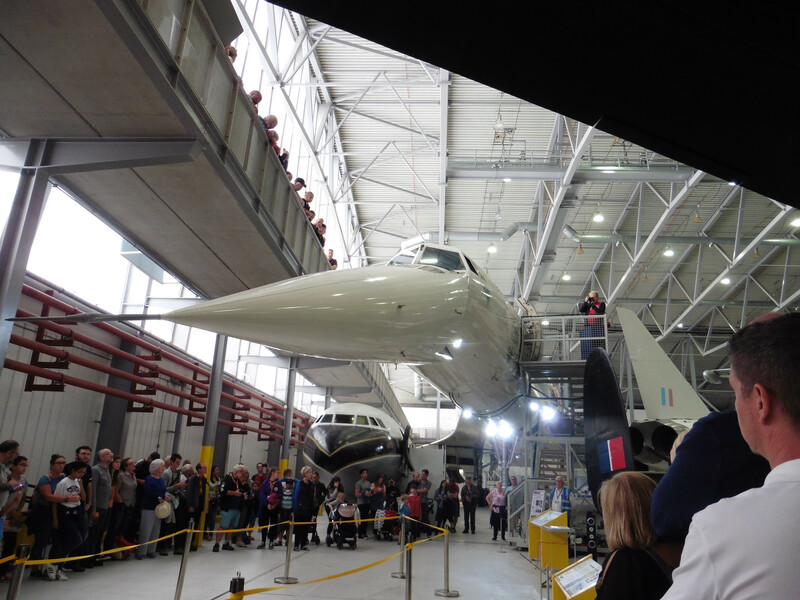 Teh Duxford Concorde earlier thislast year. They've rigged up a hydraulic power pack. I'll try and link to a video as well, it has an extra "experimental" position as well as they didn't know exactly how much droop would be needed. That never happened to me in four years there! In Summer 1990 I was in a hotel car park at Manchester airport when an Air France Concorde took off, full chat, afterburners - the lot. Thank you Mr L. Magic. I have a big grin on my face at breakfast. I saw Mr G racing many a time, my late dad and I regularly went to the Easter TT at Silverstone, and also the July GP, as we were both saloon car fans. Standing on the old banking at Copse, watching Mr G manhandling a huge Ford Falcon, or some other USAnian barge, surrounded by a buzzing swarm of Minis and Imps. Magic. 50 years ago and it seems like only yesterday. And those long-tail 917s were something else. Never seen that Nigel Roebuck quote before. You've made my day. Mr Roebuck used to do a Q&A thing on Autosport's webby SCIENCE years ago; I saved that one for posterity. And didn't save the one which was his answer to "my why out of all the then triple F1 champions no-one ever mentioned Jack Brabham"
I was once standing behind a 917K, admiring the engine (the "bonnet" was up) when it was fired up. It was like a certain Slade song. Curiosity about the actual departure times of Concorde has revealed that both BA and Air France Concordes were flown by Braniff crews from Washington to Dallas-Fort Worth and back, which required US ID numbers to be stuck on for that subsonic domestic component of the flight. At Washington, a vinyl sticker (14-15" X 24") was removed revealing the "G-BO" (Great Britain) or "F-WT" (France) letters, allowing the aircraft to travel on to London or Paris. On U.S. domestic flights, the stickers were place over the foreign registration and sported the "N81" or "N94" letters. At this point, British Airways or Air France crews would take over, and fly the "normal" Concorde routes to London or Paris taking the "white swan" to Mach 2 and 57,000-60,000 feet. Flight certificates were kept in the forward lav of the airplane, and had to to be switched at Dulles. Lt. Col. Larrington (retd.) had one of Concorde and the Red Arrows in formation over Niagara Falls but alas it was an inkjet print of a photo a mate sent him and has faded to nothing chiz.